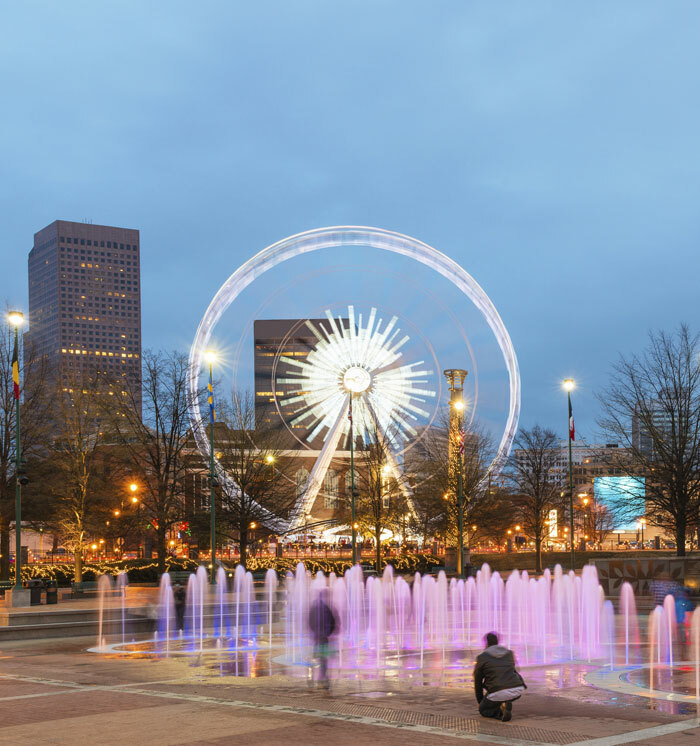 Built as a revitalization project for the 1996 Olympic Games, this urban park is one of the most popular attractions in Atlanta. This downtown 21-acre space was turned into an incredible oasis that now welcomes 3 million visitors a year to enjoy its community festivals, live concerts, and iconic Fountain of Rings. As the artistic centerpiece of the park, the interactive Fountain of Rings is one of the most photographed sights in all of Georgia, depicting the Olympic symbol of 5 connected rings. Daily water shows synchronized to popular music are the perfect place for the kids to cool off on a hot summer day. Open daily, 7am-11pm; Venue hours vary. Where can I find the audio walking tour? The 1-hour self-guided tour kicks off at the Visitor Center and offers visitors a chance to explore the park at their own pace. Tours are full of historic tales, local lore, trivia, original music, interviews, and Olympic facts. The Olympic Park was built to revitalize a troubled part of Downtown Atlanta and to provide a focal gathering point for the 1996 Centennial Olympic Games, hosted in the city. Today, the park honors the Olympic games and is a community hub for festivals, music and family events.